220 – 240V motor, 50/60Hz. Electronic speed control, with feedback effect, for speeds of 4,400 – 6,800rpm. Overall size: 300 x 262 x 170mm (without extension wing). Weight approx. 5.2kg. Table size: 295 x 240mm. Depth of cut: 1 – 22mm, uses all blades 50 – 85mm diameter with 10mm bore. I tried this saw along with the smaller Proxxon KS 230 and they do compliment each other very well. 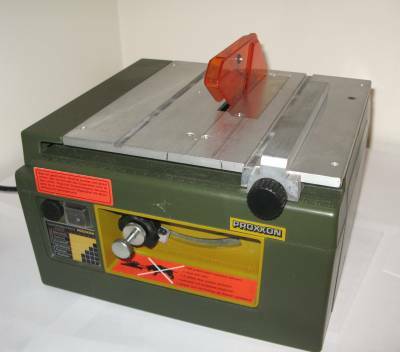 This is a very competent saw and I found it would easily cut hardwoods up to 20mm thick. The major problem I found was that when cutting down thinner strips of wood the gap around the saw blade was too great and the pieces would get dragged down the gap. The only way around this was to use the smaller saw as mentioned above. This gap is for the blade clearance as the saw blade can be adjusted in height and angle. A great feature, but you pay the penalty of having a larger gap around the blade. 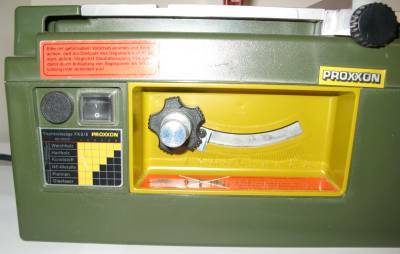 Must admit that if I owned this machine I would be tempted to make a plate that fitted over the table and reduced this clearance – could always be removed when I wanted the blade angle adjustment feature. The blade angle adjustment is quite difficult as the mass of the motor tends to pull the blade over once you release the adjusting screw. Price: approx £315.00 from Axminster Tool Centre. As a saw for cutting up larger pieces of wood for the model maker then this is a very useful tool. The gap around the blade is rather too large and so for smaller pieces of wood you need the smaller circular saw as well. This is a bit of a problem when this saw is already quite expensive and spending another £85 on the smaller saw as well makes it very expensive.